Includes everything you need to cultivate a grove of miniature trees from seedlings to forest. 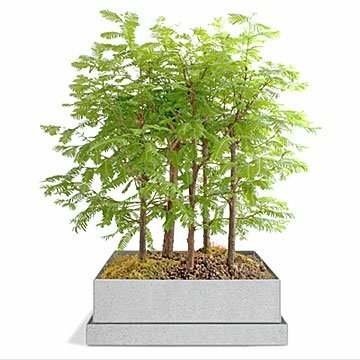 Bring the essence of nature and meditative relaxation to your life with this engaging bonsai kit. It contains everything you need to cultivate a grove of miniature trees that you foster along, from seedling to bonsai forest—redwood and moss seeds, growing medium, seedling training pots, bonsai shears, river stones, detailed directions, and a recycled US steel grow box. These tiny trees are actually ancestors of the giant California redwood. Called Dawn redwoods, they were thought to be extinct until the 1940s, when one was discovered growing in a rice field in central China. And even though its towering relative is an evergreen, the Dawn redwood is one of only two known deciduous conifers. In the fall, their leafy needles turn from green to yellow to copper, bringing the pageant of the changing seasons to your desk or kitchen window. Kit made in Idaho. Click here and here for more bonsai trees! Plant according to included instructions. Kit includes: tree and moss seed, seedling training pots, growing medium, bonsai scissors, river stone, recycled US steel box and directions. Photo shows the bonsai at 3 years old. Bought it for my tree-loving mom as a gift and she loved it! Don't waste your money on this bonsai forest kit. This kit consists of a few seeds and some dirt in compostable containers. Despite following the instructions to the letter and having an ideal environment for the seeds to germinate (and also having a green thumb in the way of gardening in general), there was not germination. We are left with a square metal tin and a some little compostable pots of dirt. We ordered our own seeds and had germinated them without trouble. This was a wonderful gift idea for my bonsai loving husband to commemorate our trip to the redwoods and he was thrilled to receive it. However, after carefully following the directions to a T and lovingly cultivating the seeds, only one seedling has sprouted in the last 8 weeks. Really disappointed that the seeds didn't grow. This Bonsai Forest makes a stunning , forever gift. A gift with purpose- both in the present , as a hobby, and in the future. A forest named for your grandchildren, grown by their grandparents! Pretty Amazing! A wonderful green gift for someone who has few wants. So far, everything has been great. He loved the gift. Can't wait o see how it grows. I gifted to ex husband from my daughter.